Updates are tracked at the bottom. This list is currently extremely out of date, I'm working on simplifying it to make it easier to maintain. Retired projects are this color. Free-DC Complete Project List for KWSN - Every project we're on should be on the Free-DC list, if any are missing please let me (or Free-DC) know so our team stats are correct. http://stats.kwsn.net/ - Our own stats site. http://boincstats.com/ - Good site for BOINC stats and signatures. 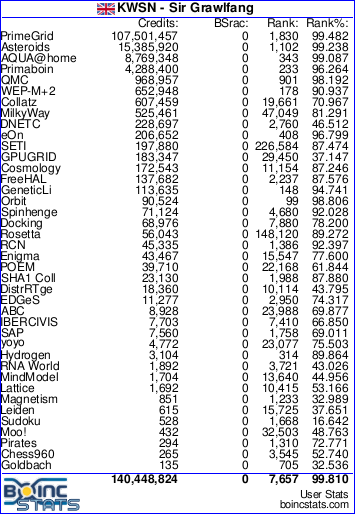 http://free-dc.org/ - Good site for BOINC & non-BOINC stats. http://lunatics.at/ - Optimized SETI@Home apps (faster crunching). [Mar. 25 2007] - Lots and lots more to come. I just got tired of typing. More will be added soon, and any additional info, corrections, thoughts, whatever will be appreciated as long as they aren't looney OR loonie. Keep it in the Gorge, you kanigits. [Mar. 26 2007] - Added a few more projects. Drastically changed the layout. Added BOINCStats and Work/User info for all projects listed thus far. Added BBC CCE Team URL, thanks A Shrubbery. [Apr. 01 2007] - SIMAP has new work. [Apr. 04 2007] - BURP, Chess960, DepSpid added. Decided linking to BOINCStat page was better than the image, so I've started redoing the links (Not done yet for all projects). Started adding project status for Beta/Alpha projects. If anyone can correct these I'd appreciate it. [Apr. 05 2007] - SIMAP out of work again. [Apr. 16 2007] - NanoHive out of work. Added DepSpid Team URL. Changed a few more BOINCStats link over to the new format (still not all done). Added Docking @ Home & Leiden Classical projects. [Apr. 20 2007] - Added SETI@Home & ABC@Home Betas. Added Pirates @ Home & PrimeGrid. Bumped SIMAP work to intermittent. Finished fixing BOINCStats links. Started adding KWSN.net stats links. Fixed various typos. [Apr. 21 2007] - Added Project Neuron. Added a few more KWSN.net Stats links. Added "Useful Links" section. [Apr. 24 2007] - Added Rosetta@Home Alpha "RALPH". Added Proteins @ Home, Rectilinear Crossing Number, RenderFarm, SZTAKI Desktop Grid, TMRL DRTG, & VTU@Home. Added KWSN.net Stats links to a few more projects. Little misc. cleanup stuff. [Apr. 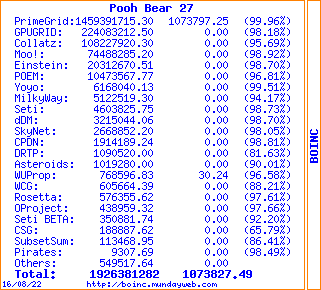 26 2007] - Added XtremLab & Zivis (that's all current BOINC projects!). Added NBPs (Non-BOINC Project) Folding@Home & DIMES. Added Free-DC complete project list for KWSN. [Jun. 02 2007] - SAP is being extended again and account creation is enabled. ABC users changed to manager only. DepSpid account creation (now open) and work status updated. Updated Project Neuron work status. Updated XtremeLab user status & team link, still no server status. Fixed DIMES Free-DC stats link. Added non-BOINC projects Majestic 12 and eOn. Need more info about eOn account creation and how to join team. [Jun. 03 2007] - BURP work status changed. [Jun. 04 2007] - XtremeLab work status changed. [Jun. 07 2007] - The Lattice Project added. [Jul. 02 2007] - Proteins@Home changed to No Work, project down. [Jul. 08 2007] - Project Neuron has work again (Thanks Killerrabbit). [Jul. 29 2007] - Cosmology @ Home added. Added BOINCStats for Lattice. LHC work upgraded to Intermittent. [Jul. 31 2007] - Superlink@Technion added. [Dec. 9 2009] - Anansi, AQUA@Home, Collatz Conjecture, EDGeS@Home, Enigma@Home, GPUGRID and FreeHAL added. Removed old Crunch3r link. Added Allprojectstats link. Retired NanoHive@Home & BBC CE, removed invalid team link. Updated ABC, removed old beta info. Updated BURP website and Team links. Updated Chess960@Home. Lots more to update still. RenderFarm has no work currently but accepting new users. BURP has a lot of work and is accepting new users last I checked. Thanks, I'll make a note of it on the list. SIMAP is also out of work currently (prompted me to pick proteins@h back up for a few days) but expects the next cycle to begin April 1st. Have you considered getting Knights to do a brief synopsis of what the various projects are? When I came back to the Knights I started up purely with Seti and have basically added my other projects based on hearing the others here talk about things they are shrubbing. That would requre work and one of the admins making a sticky that we could edit. Ok, so we agree that it isn't going to happen? It could happen if we update it often and such and keep it near the top and get JV or someone to sticky it. Location: Where I intend to be. This might also be nice because certain projects (Rosetta) you do not get as much credit as other projects (Einstien), that way people would know that Rosetta is Medical research and might be willing to shrub for it anyway. Keep it in the Gorge, you kanigits. My favourite is Cheddar (and also the only one I can recall). A Shrubbery for Prez. Let's put more bushes in the whitehouse. Shrubbing since 2000 for the KaNI!ghts. How much longer do you think the SAP WU's will last before all are done? Thank you, I've added it. They disabled all the info links on their site. They have a LOT in progress, just over 11,000. They look to be a lot like CPDN work units, taking most rigs more than a month to crunch. So I don't know, but it's likely the project will be around awhile waiting on those WUs. This is an extension already though, the main part of the project was already over. List isn't nearly done yet, just took a day (or two) off. I'll work on it some more tonight. Edit: I don't want to double post, but I've been updating the list and changing the title to reflect that. I should have some time tonight to add a few more projects to the list. Another update. Any chance at a sticky? PS: Feel free to update me on anything that's listed. Keeping track of every projects status would be very time consuming. Hrm, Toby does a nice job at statistics (except that he doesn't do Beta projects). Why would you point statistics to a different team's site for those we carry? Because the fact that BOINCStats has a team is only incidental, and has no bearing on using them for statistics. The links are not to THEIR stats, or to just the page, but to OUR stats for that specific project. I use BOINCStats for uniformity and availability of comprehensive data, the same reason I use Free-DC for non-BOINC projects, despite having nothing at all to do with the Free-DC team. Excluding any project for which we as a team have even a single credit fairly well invalidates those statistics for comparison against another team on anything but a per-project basis. For the same reason, such a per-project comparison would require using BOINCStats or similar external site for projects Toby doesn't cover. This negates the accuracy of the "combined" numbers by a significant margin, some 42,000 credits for me, or about 9% of my total, and again means that such comparisons are only valid when using Toby's stats. That said, I like Toby's stats a lot, and have spoken to him about them. But until they represent ALL projects that KWSN is active in, why would I use them in lieu of statistics that are more inclusive and "universal" in nature? And why would I want to confuse the issue by using a mix of statistics sites, precluding the ability to show "combined" stats (rather than having 10 stats blocks in my sig instead of 1)? If you'd like I can provide the Toby link for each project when available, as I certainly have no desire to deny access to those statistics to users or to pretend the stat site doesn't exist. This list was made from scratch, by me, in an attempt to make some kind of standardized list of our projects to make them easier to find, know what to join if you're looking for a new project, where to find our team, etc. I've been tweaking it as I go along, and wouldn't mind adding whatever you think would make it better/more useful to the kaaaaanights! Grand explanation. I didn't mean to sound crass, or anything of that nature, sorry if it did. I am just a curious type, and have a loyalty to our team. Being that I have always known I was looney (and no, not the Canadian dollar). Having both on the projects we do show on our stat sites would be nice, and get some of our users to notice the nice job Toby has done. Canadians use looney money? Is the Spanish word for Canadian money loonero? That said, I'll start adding the Toby-stats link for each project on the next update (maybe tonight). That also inspires me to add a section of such helpful links. I know we as a team can come up with lots of links to share hehe. The $1 Canadian coin is nicknamed the Looney, because of the Loon on it. The $2 coin is a Twoney.